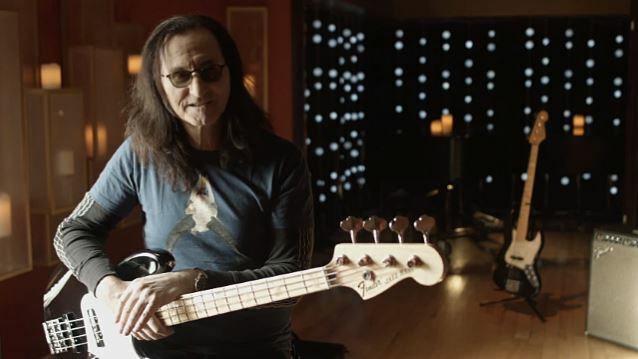 In the video below, RUSH frontman Geddy Lee discusses his Fender USA Geddy Lee Jazz Bass. The Geddy Lee Jazz Bass has been a staple in the Fender line since 1998, but earlier this year, Fender announced the addition of the USA version. The new USA Geddy Lee Jazz Bass is a new version that combines the specs and features of Lee's three favorite basses — two Fender Custom Shop versions of his signature model and the original sleek black ’72 Jazz Bass that RUSH's revered bassist/vocalist has riffed away on in front of millions of devoted fans worldwide and on many a mega-selling album. The neck has a thicker custom profile, topped by a maple fingerboard with elegant white binding and white pearloid block inlays. For enormous tone that crackles with life and bristles with the energy, its two vintage-style single-coil Jazz Bass pickups are specially wound and voiced to sound like those on Lee's prized 1972 original, and a Geddy Lee signature High-Mass bridge provides rock-solid intonation.